Soft and plush, with high loft and wool density, Australian sheepskin is often used for sheepskin rugs and pillows. This fine Spanish shearling is highly regarded for its soft hand and superb quality. Sometimes referred to as "slink lamb," curly suede or Tigrado is the name given to sheepskin with tight curls on one side and a suede finish on the other. Diesel is a process of tanning sheepskin hides in order to yield a durable finish and strong wool. A luxurious Spanish Merino shearling with a soft suede finish and silky fur that's hand-dyed to create a wild and natural look. Featuring long, coarse wool that lays flat, Icelandic sheepskin has a wild, ruggedly beautiful look that makes it perfect for shaggy sheepskin rugs and pillows. Sheepskin that's had its wool straightened, yielding a plush, smooth, fur-like appearance. Usually from Spain or Italy, this fine shearling is highly regarded for its soft hand and superb quality. This classic shearling hails from the north of Spain and is known for rugged elegance and supple softness. A pelt is the naturally beautiful hide or skin of an animal. All of our sheepskin pelts and cowhide rugs are hand-chosen for their quality and beauty; we use only the finest animal skins for long-lasting, rugged elegance. Also known as Astrakhan, Persian lamb fur boasts a tight curl, giving it a distinctively stylish textured look. Shearling is a sheepskin or lambskin pelt that has been shorn once for a wool finish that's uniform in look, length, and feel. Tanned with the wool intact, shearling pelts typically feature a sueded leather surface on one side and shorn wool on the other. Long, curly wool defines this elegant sheepskin type. Tibetan lambskin or sheepskin has a soft, silky texture and makes for great rugs, home accessories, and shawl collars. This luxurious lamb shearling features a soft suede finish on one side and long, silky wool on the other. 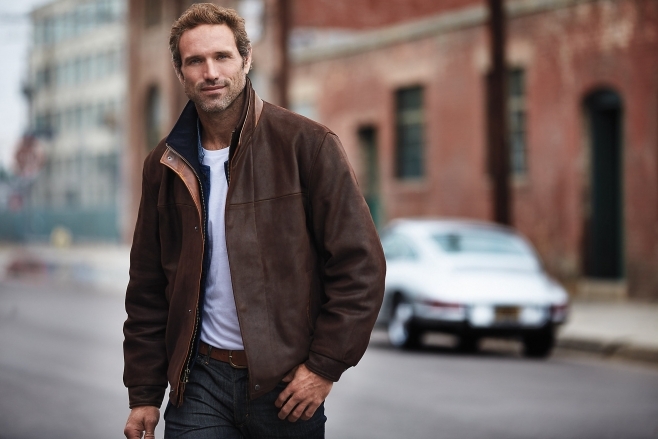 The fine Italian shearling is highly regarded for its soft hand and superb quality. When cared for properly, quality sheepskin products can last a lifetime. A type of color/finish used on fine leather hides, wherein the skins are drum-dyed for a smooth, soft hand and to bring out the leather's natural markings. Any type of leather that has been "buffed," i.e. polished to soften the surface. Sometimes referred to as "pony hair" or "hair-on leather," calf hair is simply cowhide or goat hide with the silky fur side intact. Often used for handbags and footwear for its natural animal-print color and sophisticated texture. Cowhides are select bovine hides that are naturally dried and tanned to ensure extreme softness and durability. "Hair-on cowhide" features the animal's natural fur for a rugged look and feel. The crème de la crème of skins, Deer Nappa is in a class by itself. The tight pebble grain, soft texture, and supple body of these skins are instantaneously recognizable when made into a garment. Skins are from animals farm-raised in New Zealand and are tanned to exact specifications. The unique marks and patterns found on the skins only enhance their natural beauty. Using pressurized glass or steel rollers, the leather's surface is polished to a high luster. Made from the finest goat skins tanned in Spain, goat suede is soft, velvety, and extremely lightweight. Goat suede characteristics include a short, tight nap with a very uniform luster. The skins tend to be small, and as a result, most goat suede garments are multi-paneled. Goat suede has a slightly firmer hand than does lamb suede. This term refers to the outer surface, markings, or patterns on the leather's surface. Tough and resilient but with an incredible texture, Kildare goat skins are considered the most durable of leathers. Drum-dyed and slightly buffed, this leather shows its full rugged character and fine pebble grain. 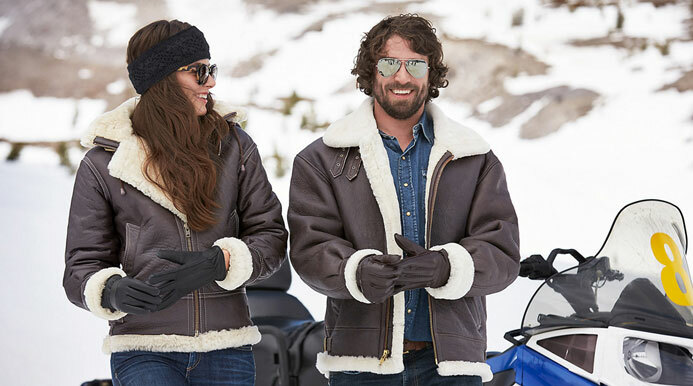 Lightweight and buttery soft to the touch, lambskin is a thin and supple leather that makes for very comfortable garments and gloves. Matisse lambskin refers to a special leather treatment process. The exterior of the leather is first drum-dyed and infused with aniline dyes, while the suede side is dyed and buffed by hand, resulting in a unique vintage look and velvety feel. Metallic dyes applied during the tanning process give a lustrous appearance. Rustic and durable, moose hide has a soft, worn-in feel right from the first wear. A short or fuzzy surface on fabric or leather. A smooth, semi-aniline leather, Napa (or Nappa) is strong, resilient, and durable, and one of the softest leathers available today. Originally used only to describe shearling, Napa has in recent years been used to interchangeably with the word "soft" to describe other types of leather, as in "Napa cowhide." A lightweight, buttery soft leather made from New Zealand lambs. A special selection of skins are used to create the natural texture on this fine leather. With a similar feel to deerskin, Norwegian lamb is drum-dyed with full-anilines for a soft, natural hand. Also known as Buff Nubuck, this rugged, suede leather ages well and grows in character with use. In a carefully developed two-stage process, selected water buffalo hides are first partially dyed and processed for a unique grain pattern. The hides are then given a velouring or nubuck treatment that gives each hide its own individual nap and velvety texture. The hides are then taken back into wooden drums to be richly dyed and treated with special oils and waxes, ensuring that each hide is strong and supple, and will give years of faithful service. Patent leather is heavily finished to give a highly lustrous, shiny look and sleek feel. A spray-on finish creates a luminous, pearlized appearance. Remy Lite is the most lightweight leather used in the manufacturing of leather garments. Made of English domestic lambskins, Remy Lite is a suede product with a light resin finish. In time, as the resin wears down, the nap of the suede will become more buffed; however, the color and visual character of the skin will not change. The fine hand and luster of the Remy Lite skin is the ultimate handwork of the tanner's skills. Extremely lightweight, soft, full-grain nappa lambskin. These skins are tanned in Italy and feature the exceptional handwork available only at select tanneries. The skins exhibit natural clarity, coupled with a soft drape and a weight that is as light as the Remy Lite. Leather that has had the underside buffed to produce a textured, velvety hand. A naturally rugged Italian calfskin with a waxy hand, tanned with a special process that allows the skin to change color tonalities as it is worn. What rugged elegance is all about. An extremely lightweight, semi-nubuck calf leather, Verona calf is drum-dyed and slightly buffed to obtain a soft feel. This, combined with the natural textured look of this skin, creates a truly rugged yet elegant leather. As natural and rugged as leather can get. A unique, shrunken-grain process ensures that the intrinsic grain in every one of these specially selected hides is brought out in a bold and dramatic manner (no embossed or printed grains are used). The hides are then deep dyed to the final color in the drum in a deliberate, slow, and controlled process. The final result is a rich, natural-grain leather that cannot be matched by the pigment overspray method that many others employ. With use, every item will burnish and develop its own unique character. This skin is exactly the same as buffed leather, but with an added layer of wax or hard grease applied to give a grain-like feel and protect the leather from moisture. This beautiful Matisse lambskin is drum-dyed and buffed to perfection to create an extremely soft, silky suede. A full-grain leather (on ordinary suede, the grain is removed), whisper suede boasts unique body and drape. *Matisse lambs are a special breed between a lamb and a goat. When cared for properly, quality leather products can last a lifetime. Also known as Persian lamb fur, Astrakhan boasts a tight curl, giving it a distinctively stylish textured look. In its natural, long-haired form, beaver features long, lustrous guard hairs over a thick, plush underfur. It offers sumptuous warmth and a natural look. Sheared beaver has a soft, velvety hand and unbeatable warmth. It is often dyed in playful, fashionable colors. Typically, the whiter the fur, the greater the value. Extremely sought after, chinchilla boasts an extremely soft, silky texture. It features a short, dense fur with lustrous guard hairs and sumptuous underfur. This distinctive fur is known for its wonderfully wild look and durability. A long-haired fur, it is often pale gray or tan, with soft, thick underfur. A soft, supple fur, Finnish raccoon features long, thick, light-colored guard hairs with black tips and dense underfur. Soft, luxurious fox comes in the widest range of natural colors of any fur, with the exception of mink. Natural color varieties include silver cross, crystal blue, red, gray, and white; pelts can also be dyed in fashionable colors. Fox fur features long, lustrous guard hairs with thick, soft underfur. Rustic and uniquely textured, goat hair features the animal's natural hide and fur for a rugged look and feel. The most popular fur on the market, and extremely durable to boot, mink is a soft, lightweight fur, with lustrous guard hairs and soft, dense underfur. The long-haired version of mink offers a more full-bodied alternative to sheared mink. Sheared mink is velvety soft, smooth, and extremely warm—a sporty alternative to full-bodied long-haired mink. Sheared mink can be dyed a wide range of fashionable colors. Soft, silky, and extremely popular, rabbit is wonderfully lightweight and warm. Typically, rabbit features medium-length guard hairs and is often sheared or grooved for a sporty look. Soft, sumptuous, and beautiful in its natural coloring, raccoon features long gray or black guard hairs with silver tips, and a thick, dense underfur. Wild and wooly, raccoon is a very durable fur. Rex rabbit is known for its plush, velvety hand and sumptuous feel. Can be worn natural, long, and silky, or sheared and sporty. Sheared Beaver has a soft, velvety hand and unbeatable warmth. It is often dyed in playful, fashionable colors. Typically, the whiter the fur: the greater the value. In its natural form, Beaver features long, lustrous guard hairs over a thick, plush underfur. It features sumptuous warmth and a natural look. Velvety soft and smooth, Sheared Mink is lofty, luxurious, durable, and extremely warm-a sporty alternative to full-bodied Mink. The most popular fur available, mink can be dyed a wide range of fashionable colors. Mink (natural) features a soft, lightweight fur, with lustrous guard hairs and soft, dense underfur. A more full-bodied alternative to Sheared Mink. When cared for properly, quality fur products can last a lifetime. The long, fine fleece of the alpaca (a South American mammal related to the llama) is rich and silky, with exquisite luster. Alpaca is a lightweight yet warm wool. Renowned for its softness, Angora wool comes from the angora rabbit and is commonly used in baby clothes, scarves and mittens, and fine sweaters. This all-woolen or worsted fabric is renowned for its velvety feel. This extremely soft, fine fur comes from the undercoats of camels. Lightweight yet remarkably warm, camel hair is commonly used to make fine coats-on its own or combined with fine wool. Like Cashmere, it travels well and does not wrinkle. A famously soft fabric, cashmere comes from the down of Kasmir goats. The process used to separate the soft fibers from the longer, coarser hairs is time-intensive and laborious, which is one of the reasons cashmere is so highly prized (it takes the fleece from over two goats to make a two-ply sweater, and six goats for a sports jacket). 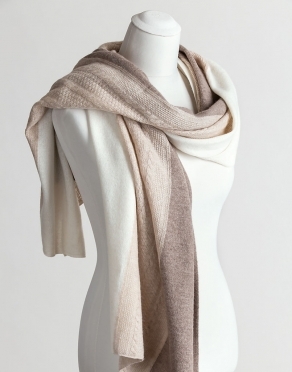 Cashmere can be used on its own or blended with silk, cotton, or wool. Like camel hair, it travels well and does not wrinkle. A fabric where either side can be used—perhaps a solid on one side and a pattern on the other, or reverse coloring in a woven pattern. This tightly woven wool twill features a high sheen. Excellent for tailoring, this fabric hangs and wears very well. A weaving pattern featuring a distinctive V-shape, usually found in twill fabric or wool. A distinctive two-color weaving pattern featuring large checks with notched corners, usually found in twill fabric or wool. Made from a jacquard loom, which allows for intricate designs to be woven into the fabric, jacquard features a raised texture and often boasts complex patterns and color gradations. In a knit fabric, such as jersey, the weave pattern loops like a braid and stretches along its length. 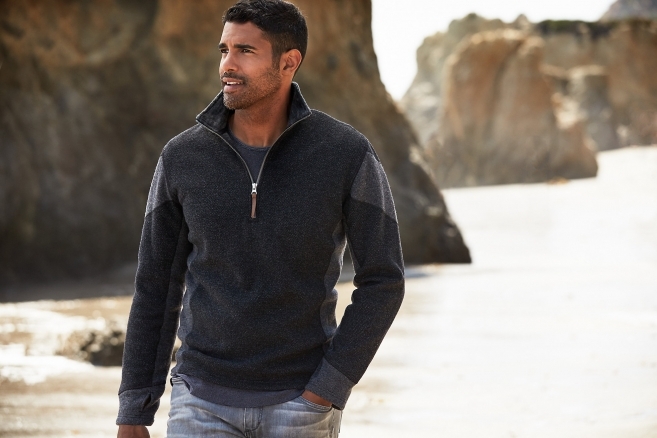 Knits are wrinkle resistant and fit to the contours of the body. A mill in northern Italy renowned for its exceptional wool. One of the finest wools, Merino is soft, luxurious, and reminiscent of cashmere. Renowned for its soft hand durability, this fabric is popularly used in fine sweaters and coats. An extremely resilient and strong fabric, Mohair comes from the angora goat. A lustrous, robust fabric. This rough, textured wool is both sturdy and stylish. Wool that has never been processed into fabric. A fabric made from firm, compactly twisted woolen yarn woven from long-staple fibers. In a woven fabric, such as linen, the weave pattern features criss-crossed fibers. Woven garments are not stretchy, and are prone to creases. When cared for properly, quality wool products can last a lifetime.